One of the most amusing things about running the Another Angry Voice Facebook page is the way that it makes right-wing blowhards so furious that they can't resist impotently blurting angry diatribes directly onto my wall. In February 2016 I had one of these types advise me that I should "try reading a newspaper and stop being a angry little old man". My friends and family would assure you that I'm neither "little" (6ft+ actually), nor particularly "old", and even if I were little and old, it would be pretty damned difficult for me to simply "stop" having those physical characteristics as suggested! I've never put up a photograph of myself in relation to Another Angry Voice because I think my appearance is pretty much entirely irrelevant to my political writing, so you'll just have to take my word for it that I'm not the short, old, balding, red-faced, permanently furious old man that some people might imagine me to be. It always amuses me that people project anger onto me simply because I chose the name Another Angry Voice as the name for my blog on the spur of the moment all those years ago, long before I had any idea that one day I'd reach an audience of millions on a weekly basis with my work. In those days I thought I'd be lucky to get 50 people interested in my political opinions! It's as if some people imagine me as being a permanently furious individual who is incapable of relaxing, having a laugh with friends and family, meditating, enjoying the natural environment, reading a good book, listening to relaxing music, enjoying my hobbies ... simply because the title of my blog contains the word "angry"! It's only actually when it comes to politics that I get really angry, but not with the furious bile-spitting type of anger that makes right-wing blowhards blather furious diatribes directly onto Facebook pages that have caused them to suffer cognitive dissonance. I try to avoid this kind of crude emotional anger as much as possible because it completely overrides our higher brain functions. When we allow ourselves to get that emotionally angry, our cognitive skills (like reason and logic) get completely lost in the fog. I prefer the kind of calm analytic anger that allows us to develop coherent criticisms and reason based plans of action. Furious, irrational, emotionally driven anger (of the kind that drives enraged right-wingers to dribble their impotent diatribes onto my Facebook page) is probably the most powerful tool of all in the guidebook to mainstream media propaganda. Once people allow themselves to get riled up with emotional anger they completely lose the ability to use the rational parts of their brain. They just want to lash out. This makes them extraordinarily susceptible to fallacious reasoning, misdirection tactics, repetitive propaganda soundbytes, cherry-picked statistics, misrepresentations and outright lies. It hardly takes any complex analysis to understand that people who try to make you furiously angry about the likes of immigrant workers, Muslims, refugees and the unemployed are simply trying to divert your anger away from the powerful people who are really to blame for most of societies' ills (self-serving establishment politicians, the reckless bankers who trashed the global economy in 2007-08, mainstream media propaganda barons, unscrupulous buy-to-let slumlords, asset-stripping corporate fat cats ...). 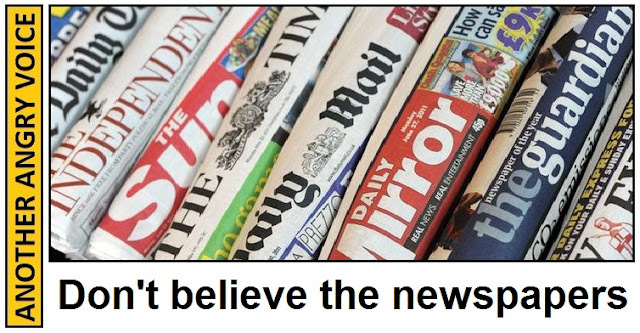 Neither does it take a great deal of brainpower to understand the furious anger experienced by people who have spent decades uncritically rote-learning the output of the mainstream press when they happen to come across a source of information that contradicts the worldview that has been carefully crafted for them. The advice to "read a newspaper" seems utterly bizarre, but it's pretty obvious where it stems from. The fact that the items I tend to post on Another Angry Voice conflict with the mainstream media narratives of the day must make people with the tabloid rote-learning mentality think that I'm completely wrong about pretty much everything. Thus their solution would be for me to join them in uncritically rote-learning the output of the mainstream media in order to cure myself of my wrongness! It makes an amusing kind sense in a crude, sub-juvenile, pseudo-logical way. I actually read various newspapers almost every day because it would be pretty much impossible to provide counter-narratives to the mainstream media without establishing what narratives they're pushing in the first place. But instead of rote-learning what they have to say I read them from a critical perspective. There's actually little harm in reading newspapers as long as you remember that newspapers are propaganda devices and that you must engage your critical thinking skills at all times (who is telling me this? Why are they telling me this? What evidence is this based on? Is it reliable evidence? Who actually owns this newspaper? What is their political agenda? ...) rather than uncritically rote-learning whatever it is that press barons like Rupert Murdoch/Jonathan Harmsworth/The Barclay brothers/Richard Desmond/Evgeny Lebedev want you to uncritically rote-learn. I don't know who these people think they're convincing when they leave comments describing my work as being nothing more than "a stream of hate filled vitriol" and dismissing everyone who follows my work as "hateful" and "envy filled". I'm pretty sure that even people who strongly disagree with most of my political views would concede that I do try to back up my arguments with stuff like facts, evidence and cogent analysis, and that I rarely ever use the slinging of vitriolic hate-filled insults tactic. I'm also pretty sure that most people would recognise that someone who insults 234,000+ people simply people because they follow a certain Facebook page must be pretty crude and narrow-minded to generalise so wildly about such a vast number of people. It seems likely that the only people who might ever be convinced by such transparent personal attacks are fellow narrow-minded right-wing blowhards of the type who consider personal abuse to be a superb form of debate winning tactic, rather than a clear indicator of cognitive weakness. I've been putting myself in the firing line for several years by expressing my opinions in public, so I rarely ever get upset by the hateful insults that get lobbed at me on a daily basis by people who detest the information I present because it conflicts so harshly with the mainstream media propaganda they source most of their political opinions from. I understand that what I say causes people like this disorientating bouts of cognitive dissonance and that their instinct is to argue back in the only way they know how, by using the same kinds of insult and smear tactics they're familiar with in the mainstream media (eeek, eeek, eeek, he doesn't grovel pitifully before the wealthy establishment minority so he's obviously evil incarnate). These days personal insults and smears from people who are incapable of offering anything remotely resembling a coherent counter argument to what I've said are like water off a duck's back. As someone who is utterly appalled by Margaret Thatcher's toxic political legacy, I don't often turn to her for quotes, but this one is particularly good. Anyone who follows the Another Angry Voice Facebook page will be able to appreciate the irony that the kind of right-wing tabloid rote-learner who adores Margaret Thatcher is also highly likely to be the kind of person to lob a load of crude personal insults at anyone they deem to be a "leftie". I don't delete insult laden comments from right-wing blowhards off the AAV Facebook page because in my view they actually do a really great job of illustrating the paucity of the arguments against what I'm saying. 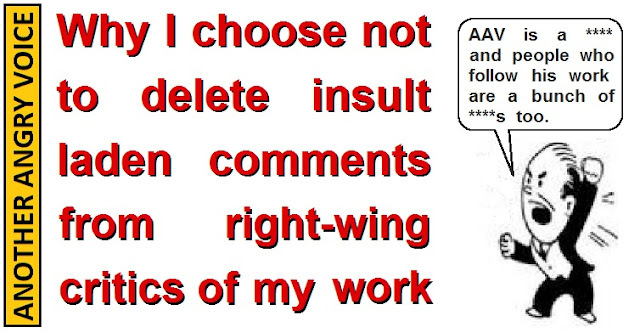 Another reason I don't delete insults and smears hurled by right-wing critics of my work is that I'm strongly opposed to censorship. 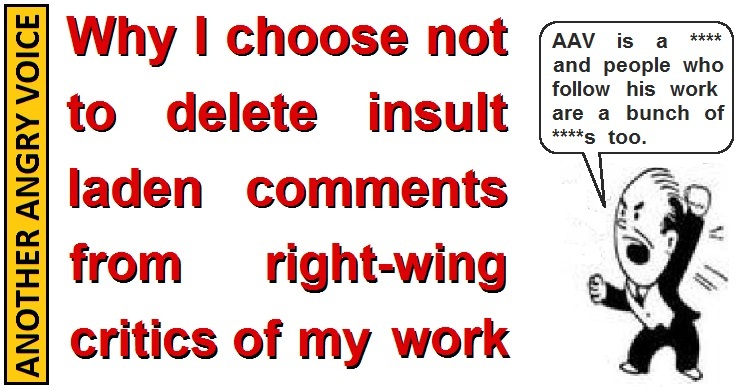 If I behaved like Britain First and dealt with any kind of criticism with the delete and ban treatment, I'd end up creating just another closed ideology echo chamber where dissenting comments are simply eradicated, rather than being subjected to critical analysis as they should be. Of course every now and then a reasonably polite right-winger who can actually string a coherent argument together shows up on Another Angry Voice for some real debate, but right-wingers like that are always massively outnumbered by blowhard tabloid rote-learner types who are utterly incapable of arguing coherently or in good faith. I know that it is often irritating to have to read insult laden diatribes from furious cognitively illiterate droolers because standards of political debate would be so much higher without these (often completely tangential) interjections. However comments like these are very useful at illustrating the mentality of people who counter facts and analysis with insults and smears. Insult laden comments from right-wingers help us understand the very serious problem that there are an awful lot of people out there who are so unfamiliar with the parameters of reasoned debate that they consider personal insults and smears to be debate winning arguments (rather than the lowest possible form of debating tactic). A mindset like that is entirely necessary in order to view David Cameron as statesmanlike and sincere (rather than the snide elitist liar he actually is). It's vitally important that we recognise this problem and actively confront it with facts, evidence, coherent explanations and cogent analysis, rather than just deleting the evidence that it exists and hoping that it somehow just goes away. 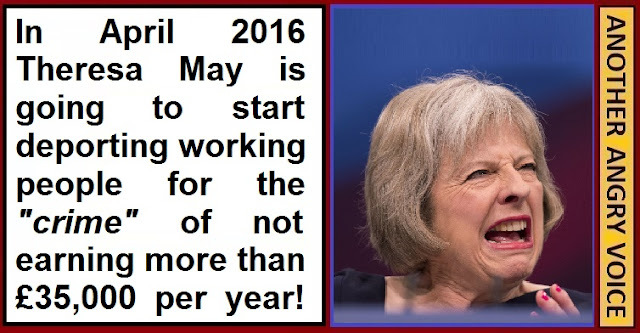 In April 2016 the Tory government are going to begin deporting working people from the UK for the "crime" of not earning more than £35,000 per year. In this article I'm going to run through just a few of the many reasons that mark this policy out as perhaps the most blatant example ever of Tory policy built on a foundation of nothing more than malice and incompetence. The average wage in the UK is around £21,300 per year so it seems a little odd that people who earn many thousands of pounds per year more than the average UK worker are facing deportation for supposedly being a drain on society. Theresa May's justification for setting the bar so high is that she wants to reduce Tier 2 migration from outside the EU from around 60,000 per year to 20,000. I've had a long look for the official calculations behind these widely cited numbers, but they don't seem to be available, possibly because they were just plucked out of thin air or drawn up on the back of a fag packet like so much ideologically driven Tory policy. The idea of clamping down on working non-EU migrants to reduce net migration might seem to make sense if you look at the Tier 2 migration figures in isolation, but with a little bit of context the plan begins to look utterly ridiculous. The number of migrants coming to the UK on Tier 2 work visas from outside the EU is absolutely dwarfed by those coming from within the European Freedom of Movement area, and those coming from outside the EU for other reasons (family visas, student visas ...). In 2010 the Tories pledged to reduce net migration to below 100,000, but instead they increased it dramatically, so much so that by 2015 they oversaw the biggest net inflow of migration ever (330,000). The idea that deporting a few tens of thousands of skilled migrant workers is going to do anything significant to slow down the inflow is as ludicrous as the economic apartheid scheme Theresa May imposed against British families with a non-EU spouse. Go away skilled workers, you're not welcome here! The idea of driving away tens of thousands of skilled workers while hundreds of thousands of unskilled workers are allowed to come into the UK from the EU is absolutely crackers ... unless of course you understand that the Tories are intent on turning the UK into a low-skill low-pay economy to compete with the likes of China and India instead of a high-skill high-pay economy to complete with the likes of Germany and Japan. In order to become a Tier 2 migrant to the UK the individual must have a job offer from an employer who has shown that it's a position that can't be filled by a local worker and they have to pay hundreds of pounds in fees just to make the application. Additionally, despite paying income tax and national insurance on their earnings, they are not allowed to claim benefits, and they have to pay an NHS surcharge in case they need medical treatment. This means that they make a very large net contribution to the UK tax system. The Tories' own calculations show that this policy of kicking out tens of thousands of skilled migrant workers is going to cost the UK economy hundreds of millions of pounds per year! Not only are Tier 2 migrant workers a net benefit to the UK tax system, they're also good for British businesses. Simply turfing them out wouldn't just harm the government balance sheet, it will do immeasurable harm to countless British based businesses. The Australian Department for Foreign Affairs and Trade (DFAT) conducted a study that showed that a majority of Australian businesses operating in the UK considered the changes would negatively impact their UK investment plans. The report concluded that Theresa May's ideologically driven changes to the immigration rules will result in "structural damage to formal relations between the two countries". After that report came out the Australian High Commission stated that "UK working visa changes are making the country a less welcoming destination for Australians. This has the potential to harm the UK's image and reputation in Australia and long-term, it might undermine the unique Australia-UK bond". It's absolutely clear from statements like these that Theresa May's ideologically driven changes to the UK immigration system have the potential to do extremely serious damage to the UK's long-standing trade relationships with countries like Australia, New Zealand, Canada and the US. The majority of teachers and nurses don't earn £35,000 per year. In 2015 the Tories buckled under pressure and decided to temporarily exempt nurses and teachers in shortage subjects from the £35,000 threshold. However a temporary exemption is clearly of very little comfort to teachers and nurses considering a move to the UK, because who would spend thousands on visa applications, the NHS surcharge and travel to establish a career in the UK when they know that the rules could simply be changed on a whim by some Tory government minister a few years down the line meaning their profession is no longer exempt and they're facing deportation from the UK after putting in years of effort (and tax contributions)? Other countries are already trying to poach the skilled workers we're going to deport! Here's an article laying out the case for British health professionals on Tier 2 visas to consider moving to Canada, where they have introduced a policy of attracting nurses from overseas, raising nurses' pay and training up more Canadian nurses (as opposed to the Tory policy of driving away overseas nurses, imposing real terms cuts in nurses' pay and scrapping NHS bursaries to actively disincentivise people from training as nurses). If the EU referendum results in the UK withdrawing from the European Union and abandoning the European Freedom of Movement project it will serve as a double whammy in combination with the ban on skilled migrant workers. The deportation threats against workers earning less than £35,000 per year will be provide an obstacle to recruitment for British employers, but in combination with a ban on EU migration too it could prove completely disastrous to recruitment to British industries, especially in the high-tech industries. The idea that untrained British workers can just step in and fill the roles of all the skilled workers who are going to be deported is laughable. In order to take over the positions British workers would need lots of education and training to acquire the necessary skills. The big problem here is that the Tories have spent the last six years cutting university funding, slashing investment in research and development funding and savagely defunding the adult education and training sector. Severely damaging British businesses and the UK economy by deporting skilled migrant workers whilst simultaneously attacking the means by which British workers might acquire the skills to fill the roles is a demonstration of the absolute lunacy of the Tory party, but considerations like this don't matter to the xenophobic knuckle-draggers this policy is designed to appeal to. It doesn't matter a jot to the extreme-right drooler that this policy will cause £billions worth of damage to the UK economy, they're far too thrilled with the almost sexual sense of pleasure they get at the idea of "getting rid of darkies". The idea that a job is only worth doing if it pays more than £35,000 per year is a perfect demonstration of the Tory mentality that monetises everything. Who cares if the worker is providing social, cultural, technological or environmental benefits that can't be measured in £s. The modern Conservative is only interested in measuring things by price, not by value. If you teach kids, play a musical instrument in a world renowned orchestra, design computer software or work in a nature reserve, it doesn't matter what benefit you think you're providing to the UK by doing so, unless you earn more than £35,000 per year at it the Tories have you marked as completely worthless scum who need to be turfed out of the country as soon as possible. Why ban Tier 2 spouses from working? Aside from the ridiculous £35,000 earnings threshold the Tories are also bringing in a number of other changes to Tier 2 visas. One of the most unintelligible is a new ban on the spouses of Tier 2 migrants working in the UK. 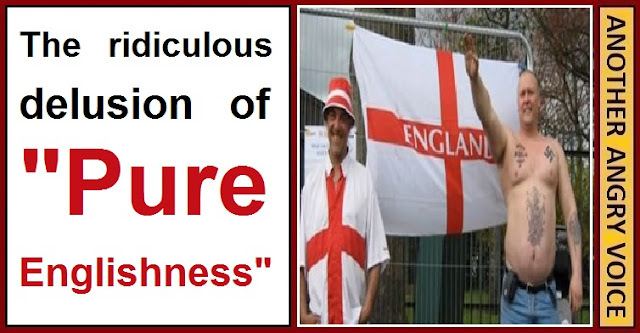 This ban is utterly inconsistent with two claimed pillars of Tory ideology. Firstly they claim to want people to work, yet they're actively banning a load of people from working while they live in the UK. Secondly they love to claim to be a pro-family party, yet this is another example of their immigration rules that seem to be deliberately designed to break up families. What message does this send to British workers? Setting the deportation level so far above the average UK salary sends a very strong message to any British worker who earns less than £35,000 per year (the vast majority of the UK workforce). The message that the Tories are sending is that they consider you to be absolutely worthless scum who they would gladly deport from Britain if only they could. Of all of the malicious and incompetent Tory rubbish we've had to suffer for the last six years (George Osborne's socially and economically destructive ideological austerity agenda, Theresa May's constant attacks on our rights and liberties, Iain Duncan Smith's campaign of terror against sick and disabled people, Jeremy Hunt's policy of running the NHS into the ground in order to justify privatising it, Michael Gove's stealth privatisation of the education system ...) this latest plan to begin deporting working people for the "crime" of not earning above £35,000 per year, at a cost of £billions to the UK economy, looks like a contender to be the most malicious and incompetent of the lot. 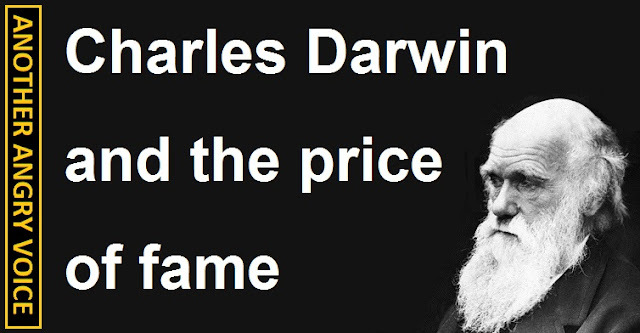 Charles Darwin was born on the 12th of February 1809. Alongside Alfred Russell Wallace he is credited with the development of the theory of evolution by natural selection. He is rightly considered to be one of the great thinkers of the 19th Century. Unfortunately, due to his fame he has become a highly misrepresented individual. His name is used to categorise a number of vile social theories that he never would have supported, and his image has often been appropriated to promote a militant form of atheism he would never have wanted to have been associated with either. A warped interpretation of Darwin's theory of evolution has been used to justify labelling ideologies that promote racism, elitism, competitive strife and eugenics as "Social Darwinism". Nothing in Darwin's work suggests that he would have supported social policies of demonisation, discrimination, impoverishment and even outright extermination against sectors of society deemed to be inferior by powerful minorities. In fact Darwin's theories are entirely compatible with the idea of community rather than ruthless "survival of the fittest" because it's beyond obvious that a tendency towards forming into community groups can provide an evolutionary advantage (think of shoals of fish, murmations of starlings, colonies of ants, and the more complex social groupings of higher mammals like primates, elephants, dolphins and whales). In 1902 the anarchist philosopher Peter Kropotkin provided a detailed explanation of how cooperation amongst species was not just compatible with Darwinian evolution, but actually essential to it, in his book Mutual Aid: A Factor of Evolution. The fact that Darwin never wrote anything to suggest that he would have supported racist or eugenicist policies of deliberately eradicating members of society that are deemed "weak" by the powerful didn't stop people from evoking his name in the blanket term used to describe such theories. It's appalling that the concept of actively cleansing society of so-called "weaker" members still bears his name. Charles Darwin is also often used as a poster boy by militant New Athiest types, despite the fact that he was nowhere near as intolerant of theists and theological debate as they are. The way Darwin has been appropriated by the militant atheists is actually very similar to the way the economist Adam Smith has been appropriated by the militant Laissez-faire economic hard-right, despite the fact that the most cursory examination of his work reveals that he was nowhere near as fanatically right-wing as they are. Another example of this kind of appropriation is the way the work of George Orwell is often invoked by right-wing people to attack socialism, even though Orwell was a committed democratic socialist who criticised the Soviet Union for their authoritarianism, not simply because they were left-wing. "It seems to me absurd to doubt that a man may be an ardent theist and an evolutionist ... But as you ask, I may state that my judgement often fluctuates. Moreover whether a man deserves to be called a theist depends on the definition of the term: which is much too large a subject for a note. In my most extreme fluctuations I have never been an atheist in the sense of denying the existence of a God. I think that generally (& more and more so as I grow older) but not always, that an agnostic would be the most correct description of my state of mind." The idea of invoking the name of a self-declared agnostic (who maintained civil relationships with many theists) in order to promote a rabid form of militant atheism is just as bad as using the name of an economist who supported state intervention (such as infant industry protection) to promote right-wing anti-state fanaticism, or using the work of a lifelong democratic socialist to promote right-wing political ideologies. It seems to be the price of fame that all kinds of people who have little regard for what you actually believed in will latch themselves onto your work, and use your image to promote their own ideologies, irrespective of whether they're actually compatible with what you said or not. The way that the names of thinkers like Darwin, Smith and Orwell are invoked in order to add a veneer of credibility to ideologies they would have been very unlikely to support themselves is bad enough, but Darwin had it even worse than most because of the way his name has been associated with a bunch of vile ideologies that are grouped together under the name "Social Darwinism". What value can be found in religious contemplation?